A good combination of Word document recovery, Excel file Recovery and PowerPoint Recovery, etc. AdreamSoft OFFICE Recovery integrates data recovery utilities for Office applications into one easy recovery wizard. Asf recovery software is third party software introducing fast and easy recovery of the asf format files that are accidentally deleted or corrupted due to some malicious applications. Lazesoft Data Recovery Just a few clicks, you can use it to recover deleted files and recover data from formatted, damaged or lost partitions by yourself. Lazesoft Data Recovery is easy to use and powerful data recovery freeware for home user. USB Hard Drive Recovery software comes with advanced powerful features to make easy recovery of deleted or lost files from external USB hard drives. It is able to retrieve data from corrupted, inaccessible, damaged and formatted USB hard drives. 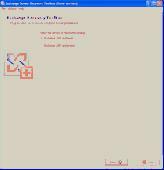 The tool analyzes damaged database files of Microsoft Exchange Server. Exchange Server Recovery Toolbox opens and repairs corrupted EDB/STM files that were affected due to incorrect user activities, viral infections and other factors.